evaporative cooling, which is by far the most effective factor. 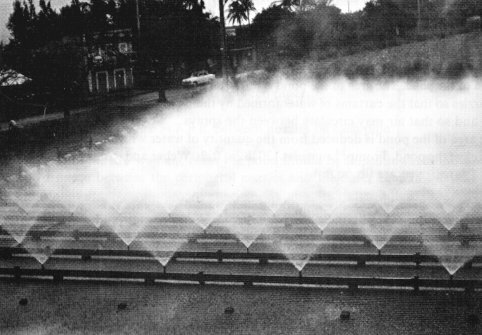 This has virtually no influence on the cooling of the water. An average depth of 1 metre should be adequate provided there is sufficient water to fill the flumes, seal wells and flood the injection and export pump suctions at the starting up of the plant. There is no advantage in exceeding a depth of 1 metre, since the increase in the mass of water in the circuit has only a negligible influence on the cooling. The surface area only is important. be of simple design, easily dismantled with no portion of smaller cross-section than the orifice. 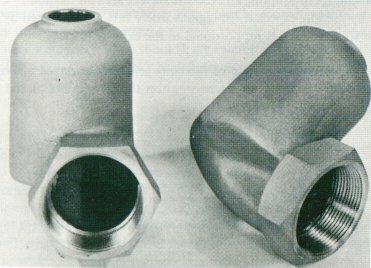 Nozzles are mounted on pipes called laterals at right angles to the main pump delivery line. Laterals decrease in size towards the end. A spray pond should be long and narrow to improve the efficiency at the centre, but cost might be prohibitive. All laterals should be provided with quick acting flushing valves at their ends, easily accessible. Pump suctions should be adequately protected from blockage by tank, bagasse and other flotsam. Easy access for cleaning screens must be provided. The arrangement of nozzles may not always conform to a star pattern as cost will be an important consideration but efficiency might suffer. Due to loss of water from the pond, a fresh water make up system operating on pond level is required.